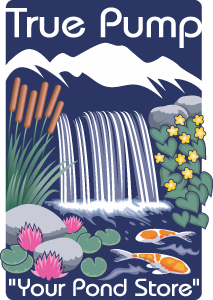 The Ecosystem Pond is an ideal environment for koi, goldfish and other decorative species. Fish add color, character and interest to your Ecosystem Pond. These “wet pets” quickly become part of the family and offer great stress relief as they come to the surface to greet you and look to be fed. A common misconception is that fish require massive amounts of care and increase maintenance. 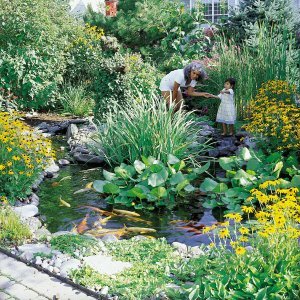 In truth they are an important part of the ecosystem and require very little extra care in a properly constructed pond with adequate filtration. It is important to avoid over-populating the pond and filtration system. We recommend 1 inch of fish for every 10 gallons of water, i.e. a 1000 gallon pond can support a total of 100 inches of fish. The #1 question we are asked about fish is “What do I do with my fish in the winter?” An Ecosystem Pond that is at least 24” deep is all that you need to sustain your fish through the winter. As the pond surface freezes it is important to keep an open area in the ice to allow harmful gases to escape. We recommend operating your pond pump throughout the winter which will allow this gas exchange to take place. If you decide to turn off your pond pump you will need to have a supplemental form of circulation which can be an aerator or small fountain pump. 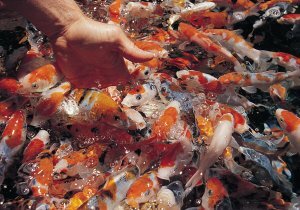 Proper feeding of your fish is important to the health of the fish as well as the balance of the pond. Pond fish can survive on food sources naturally available in a pond, but by feeding them a high quality food you can increase growth rate, enhance color and boost their immune system. Plus the added benefit of feeding is that your fish can be trained to come up and greet you anytime you approach your pond! Fish food is high in nutrients so for good water quality you should only feed them the amount of food they can consume in approximately 5 minutes. Also, because fish are cold blooded they cannot digest food properly in colder water temperatures so you should not feed your fish when the water temperature drops below 50 degrees. True Pump carries a complete line of fish pond supplies including fish food, fish health products, pond treatments, nets and other seasonal items for colder climates to help you care for your “wet pets”.